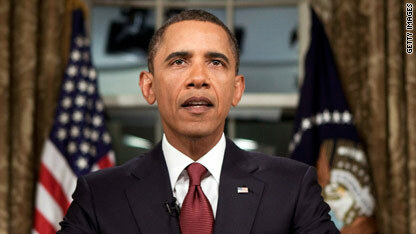 (CNN) - President Obama declared that "the American combat mission in Iraq has ended" in his prime-time address Tuesday. "Operation Iraqi Freedom is over, and the Iraqi people now have lead responsibility for the security of their country," he said. The mission officially drew to a close at 5 p.m. Tuesday. Obama said the winding down of the war in Iraq means it's time for citizens to unite and build a better life for all Americans. "Our most urgent task is to restore our economy and put the millions of Americans who have lost their jobs back to work," he said in his nationwide address from the Oval Office. "... This will be difficult. But in the days to come, it must be our central mission as a people and my central responsibility as president." Hurricane Earl may prompt evacuations along the U.S. Atlantic Coast even if it does not make landfall, because it may come close enough to trigger storm surge flooding and high winds, officials said Tuesday. The National Hurricane Center issued a hurricane watch for most of the North Carolina coast, from Surf City, North Carolina, to the state's northern border with Virginia, including the Pamlico and Albemarle Sounds. It called Hurricane Earl "large and intense." Earl, which quickly morphed into a Category 4 hurricane on Monday, dealt a glancing blow to Puerto Rico and the Virgin Islands, downing trees and knocking out power lines. Tuesday, the hurricane was passing the Turks and Caicos. Filed under: North Carolina • U.S.
Good evening. Tonight, I'd like to talk to you about the end of our combat mission in Iraq, the ongoing security challenges we face and the need to rebuild our nation here at home. I know this historic moment comes at a time of great uncertainty for many Americans. We've now been through nearly a decade of war. We've endured a long and painful recession. And sometimes in the midst of these storms the future that we're trying to build for our nation - a future of lasting peace and long-term prosperity - may seem beyond our reach. Almost seven and a half years ago, President George W. Bush launched a blistering "shock and awe" invasion of Iraq. The goal: Eliminate a perceived threat of weapons of mass destruction while replacing a hostile, tyrannical regime with a friendly democracy in the heart of the Middle East. At 5 p.m. ET - at a cost of more than 4,400 U.S. military personnel killed and 30,000 wounded - America's combat mission in Iraq officially drew to a close. Generations of rock hounds and miners have turned the earth in western North Carolina, looking to bring a special ruby, sapphire or emerald - the "big three" of the gem world - to the light. The passion started early for Terry Ledford, 53, who operated a gem stand on weekends when he was a kid. "I always loved rocks," said the Spruce Pine resident. For W. Renn Adams, 90, the world of spodumenes, hiddenite and beryl runs even deeper in his blood. His Alexander County family has been digging for them since the 1880s. The men's interests became intertwined early this decade when they became partners on the Adams family farm, which grows corn along with its treasures below. And then came that day in August 2009 when Ledford saw what looked to be part of a 7UP bottle. It was an emerald crystal. A very big emerald crystal. Some 310 carats of it. A look at highlights from the day's business news. Stocks were little changed at the end of a choppy session Tuesday, closing out a lackluster August for the market, as investors weighed meeting minutes from the Federal Reserve against upbeat economic reports. The Dow Jones industrial average gained 4 points, or less than 0.1 percent. The S&P 500 edged up less than 1 point. The Nasdaq composite lost 6 points, or 0.3 percent. All three indexes posted monthly declines. The Dow lost about 4.3 percent in August, while the S&P 500 fell 4.7 percent and the Nasdaq slumped 6.2 percent in the month. Officials tending to the 33 men who've been trapped in a Chilean mine for more than three weeks are preparing to send them their first delivery of solid food this week. Through three bore holes that are about 4 inches in diameter, officials have been sending down items to make the miners more comfortable and physically and mentally as fit as possible. But until now, the only nutrition sent to the miners has been in liquid form. The miners have been trapped in a cavernous shelter more than 2,300 feet below the surface since August 5, and a months-long drilling process to free the miners began late Monday night. 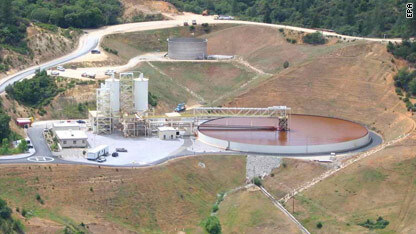 The Iron Mountain Mine acid draining treatment facility, the heart of the EPA effort to clean the site. A few days ago, environmental scientists and representatives of the Environmental Protection Agency trudged through steaming toxic sludge at what the federal agency considers one of the worst Superfund sites in California. Iron Mountain, a former mine that is dripping with acid capable of eating away even specially resistant concrete, is outside Redding. The mine shut down in the 1960s and has been closed to the public since. But runoff from the site potentially threatens salmon in the Sacramento River, which is why the EPA closely watches a treatment facility that has kept the river clean and has kept pollution mostly at the mine, said Rick Sugarek, an EPA point person for a cleanup effort that has spanned more than 20 years. About 2 percent of the original pollution continues to discharge from the mine, said Sugarek. And that's unlikely to change because there's simply no technology to get rid of it. The San Francisco Chronicle explains why that is, and how Iron Mountain became a hazard. "This is a common problem at hard rock and coal mines - iron sulfide turns into sulfuric acid - but at Iron Mountain, it's 500 times more concentrated. It's more like battery acid coming out of the mountain," he told CNN. The EPA spends $1 million a year on lime alone to help neutralize the acid, he said. There are several dozen workers and contractors who do maintainence for the EPA on the plant. Even with stringent safety measures in place, workers have reported going home and their jeans falling apart, said Sugarek. 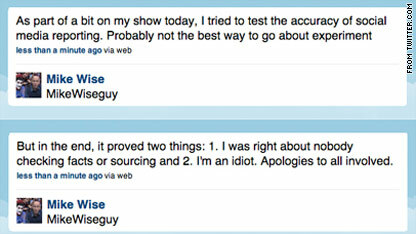 Mike Wise, one of the Washington Post’s leading sports columnists, has been suspended for a month for posting bogus NFL news on his twitter feed, Wise announced on his radio show this morning. Yesterday in what Wise said was an effort to “showcase the absurdity of bad journalism” he falsely tweeted that Pittsburgh Steelers star quarterback Ben Roethlisberger would be suspended for the first five games of the upcoming NFL season. This would have been a major headline since the NFL has only said Roethlisberger would be suspended anywhere from four to six games for his behavior at a Georgia night club. 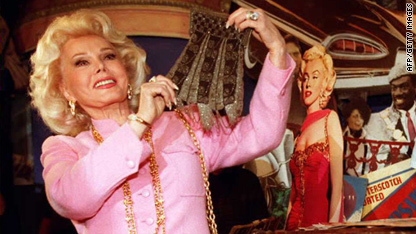 Actress Zsa Zsa Gabor was rushed to the hospital after her husband found her "unresponsive" Tuesday morning, her publicist told CNN. Gabor, 93, was taken by ambulance from her Bel Air, California, home to Ronald Reagan UCLA Medical Center, where she had undergone hip replacement surgery earlier this summer, publicist John Blanchette said Tuesday. She was hospitalized for several days earlier this month for complications relating to the surgery, he said. Her husband, Prince Frederic Von Anhalt, was "very agitated" after calling for an ambulance Tuesday morning, he said. Gabor had returned home from the hospital two weeks ago because she "wants to spend her final days at her home," Blanchette said at the time. Four Israelis were killed near Hebron in the West Bank on Tuesday, Israeli medical sources said, and one of those killed was pregnant. The army said the incident occurred near Bani Naim junction. As Iraq combat mission ends, nation asks: Was it worth it? 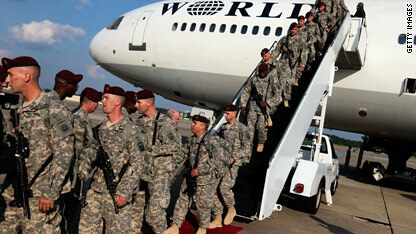 Paratroopers return from their year-long tour in Iraq. When President Obama sits down in the Oval Office on Tuesday night to address the nation about today's official drawdown in Iraq, he'll be speaking about the end of the U.S. combat phase and marking a new chapter in a war that has been controversial for seven years. The combat mission in Iraq has been marked by many key events: It began with a declaration of weapons of mass destruction and was followed by a lengthy justification from the Bush administration, the capturing and execution of Saddam Hussein and a wave of sectarian violence. The war so far has killed more than 4,400 U.S. troops among the thousands of casualties. As Obama prepares for his delivery, and the GOP prepares its own assessment, Iraqi Prime Minister Nuri al-Maliki held a national address of his own Tuesday, during which he proclaimed Iraq as "sovereign and independent." As the milestone nears - officially at 5 p.m. - politicians, columnists, editorial boards, soldiers and everyday citizens are seemingly taking the opportunity to ask one question that perhaps has no apparent answer: Was it all worth it? Evacuations may be required along the U.S. Atlantic coast even if Hurricane Earl does not make landfall, as storm surge flooding and other effects may be an issue, FEMA Administrator Craig Fugate told reporters Tuesday. Hurricane Earl was heading back out into the open Atlantic Tuesday after dealing a glancing blow to Puerto Rico and the Virgin Islands, but forecasters warned the large and dangerous storm could have the Carolinas in its sights later this week. [Updated at 11:47 a.m.] Swedish prosecutors will not rule Tuesday on charges against WikiLeaks editor-in-chief Julian Assange, a prosecution representative said, reversing an earlier statement. [Posted at 9:13 a.m.] Swedish prosecutors questioned Julian Assange, the editor-in-chief of the whistleblower website WikiLeaks, for about an hour Monday, his lawyer said Tuesday, following complaints against him from two women. "He maintains that he is completely innocent," his lawyer Leif Silbersky told CNN. Prosecutors will decide Tuesday about charges against him, Gun Sjogren at the prosecution authority told CNN. Austin will assume command of Operation New Dawn, overseeing the nearly 50,000 U.S. troops remaining in Iraq after the official handover. 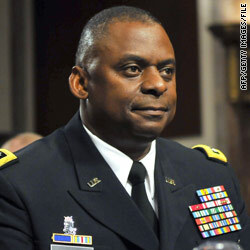 Austin, who was the first African-American to be a commander at Fort Bragg, North Carolina, relieves Gen. Ray Odierno, who commanded Operation Iraqi Freedom for the past four years. He is a tall man who has kept a low profile, according to a New York Times profile this spring. He's served two tours in Iraq, during the time of highly publicized military campaigns in Basra and in Baghdad's Sadr City. He also commanded the 10th Mountain Division in Afghanistan, and was awarded the Silver Star for his combat duties, the Times said. Austin has the geopolitical wherewithal to engage the Iraqi people, sources told the Times. In 2009, Austin succeeded Gen. Stanley McChrystal as director of the Joint Staff, where he worked directly for Adm. Mike Mullen, the Joint Chiefs chairman. 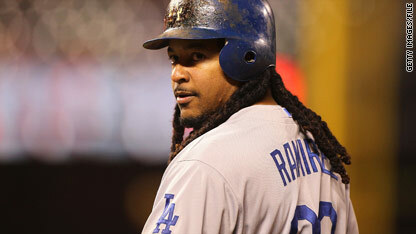 Manny Ramirez is gone, but the circus remains very much a part of the Dodgers, writes SI.com’s Lee Jenkins. The trial, which began Monday in downtown Los Angeles, has both sides arguing over ownership of the team and is expected to be among the most expensive in the history of California. Many are speculating it could result in the franchise being sold. While the McCourts wage their battle in the courtroom, there’s plenty of on-field action, with the U.S. Open, baseball and soccer. Here are a few highlights, all times Eastern. U.S. Open (11 a.m, ESPN). Top-seeded Rafael Nadal and Caroline Wozniacki are in action, along with Maria Sharapova, Novak Djokovic as first-round play continues in Flushing Meadows. Iraqi Prime Minister Nuri al-Maliki proclaimed Iraq as "sovereign and independent" during a national address Tuesday to mark the official end of the U.S. combat mission in his country. Al-Maliki praised the strides made by Iraqi security forces in fighting terrorism, attributing their efforts to making the U.S. drawdown possible. The combat mission formally ends at 5 p.m. ET. Drilling has begun as part of an effort to reach the 33 miners who have been trapped underground in Chile for more than three weeks, authorities said. The effort to drill through more than 2,300 feet (700 meters) of rock and safely extract the workers could take three to four months, officials said. The hole currently under way is the excavation hole, where the drill bit will be placed. [Updated at 10:40 a.m.] An initial United States investigation into two men arrested at Schiphol International Airport in the Netherlands shows no evidence of terrorism and no indication the men even knew each other, two U.S. officials told CNN Tuesday. [Posted at 9:54 a.m.] The two men arrested at Schiphol Airport in the Netherlands are being held on suspicion of plotting a terrorist act, Dutch authorities said Tuesday. The men arrived on a flight from Chicago, Illinois. They are Yemeni citizens who were en route to the Yemeni capital Sanaa, officials said. An announcement about whether they will be charged will be made "in a few days," authorities said in a statement. Hurricane Earl - After dealing a glancing blow to Puerto Rico and the Virgin Islands, Hurricane Earl was heading back out into the open Atlantic on Tuesday, but forecasters warned the large and dangerous storm could have the Carolinas in its sights later this week. Earl quickly developed into a Category 4 storm Monday, packing winds of 135 mph (215 kph). It also grew large, with hurricane-force winds stretching 70 miles (110 kilometers) from its center and tropical storm-force winds extending outward some 200 miles (325 kilometers). Maps, projected path | iReport: Is Earl headed toward you?